Pray to deepen our relationship with God and reflect on what type of person He calls us to be. Fast to remove the things that get between us and God and to live in solidarity with those in need. Give alms to our brothers and sisters in need, honoring Jesus' call to serve our neighbors. Learn more about How to Practice Lent. 75 percent of your donations support CRS' humanitarian relief programs in nearly 100 countries worldwide. 25 percent of your donations go to hunger and poverty alleviation efforts in your own community. 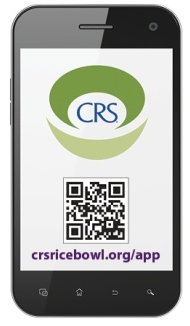 Download the New CRS Rice Bowl Mobile App! CRS Rice Bowl, Catholic Relief Services' 39-year-old Lenten program, known for the colorful cardboard rice bowl used by generations of Catholics each Lent, is making the leap to mobile devices today with the introduction of its first App. The Rice Bowl App allows people to tap into a rich spiritual experience and make the 40 days of Lent a time that can change their lives while helping to get closer to a world free of hunger. Now, more than ever, CRS Rice Bowl is the simplest way to bring Lent into your life, online, offline, anytime, anywhere. Pope Francis has captured the world's attention to the plight of hunger and poverty around the world. He said, "the scandal that millions of people suffer from hunger must not paralyze us, but push each and every one of us to act: singles, families, communities, institutions, governments, to eliminate this injustice". For people looking for a way to respond to this call, CRS Rice Bowl's mobile app can help. All the resources needed to make Lent a more personal experience in a relevant and convenient way are available on the CRS Rice Bowl App. Users can schedule delivery of daily reflections to their mobile device, set and track progress towards a personal Lenten goal, view simple meatless recipes to prepare on Fridays, and read or watch stories about the people whose lives have been changed through the program. The App is free and can be downloaded from the iTunes and Google Play Store or at crsricebowl.org/app. In addition to the new app, Spiritan Campus Ministry will be placing CRS Rice Bowls around campus throughout Lent for the Duquesne Community to participate!